What do Twilight and the Starseeker mount say about WoW's next expansion? What do Twilight and the Starseeker mount say about WoW’s next expansion? Recently — and a surprisingly short time after they were decrypted — the Twilight battle pet and Luminous Starseeker mount were added to WoW as purchasable items. 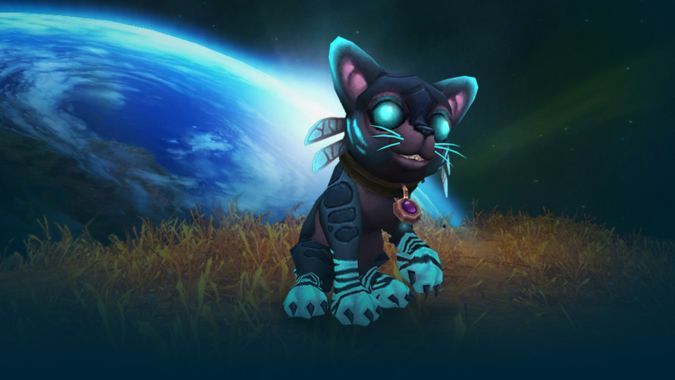 They’re totally adorable, and Blizzard likely made a lot of money within a few hours of them going live because who can resist kitties? But besides being super cute, the pair may also hold an interesting secret. Now this is all entirely speculation, but Blizzard has a habit of releasing store pets and mounts that tie into an upcoming expansion in some way. The Enchanted Fey Dragon and Iron Skyreaver came out in Mists of Pandaria and were featured heavily in Warlords zones. The Mystic Runesaber mount and Brightpaw pet came out in Warlords and were a stable of Suramar in Legion. Now this could mean Blizzard is instead tying the duo to Argus and 7.3 rather than 8.0 — or it could mean we’ll be staying outside Azeroth for longer than we thought. Personally, I’m a bit conflicted here. The store-item trends point to these being tied to 8.0, but Blizzard’s history of expansions leading to entirely new, different continents makes me think otherwise. Plus, I’ve gotten my hopes up for an expansion centered around the Old Gods and/or Lich King. What do you think? Are these two kitties giving us a hint of things to come and, if so, what? Or are these simply being used to hype 7.3?